The principles for developing National Health Insurance (NHI) as described in the Green Paper are to improve access to quality healthcare services for the whole population and to provide financial risk protection against health-related catastrophic expenditures (Table 1). Comprehensive healthcare will be provided through accredited and contracted public and private providers, with a strong focus on health promotion and prevention services at the community and household level. The first 5 years will focus on strengthening the public sector in preparation for new NHI systems, with the launch of the new central NHI fund envisaged in 2014/15. We review progress since the Green Paper was launched in August 2011 , and summarise a more in-depth review just completed. The National Department of Health (NDOH) has consulted with medical scheme administrators, labour, the pharmaceutical industry, professional associations for various occupations, statutory bodies, government departments, academia, civil society and Parliament. Since the launch of the NHI Green Paper, over 100 submissions have been made to the NDOH, and an international conference was held to exchange experience of introducing universal coverage in other countries. In visiting each of the 11 NHI pilot districts, the Minister of Health has met over 15 300 stakeholders. 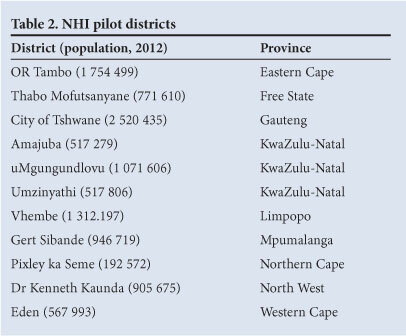 The first cohort of 11 pilot districts was launched in April 2011 and covers every province, focusing on under-served communities (Tables 2 and 3). Dedicated funds catalyse experimentation and the setting up of new systems and capacities. Special links with academic groups specialising in health systems and public health research provide an opportunity for 'bottom-up' learning to inform central policy and the roll out in other districts. The Government's White Paper, expected in 2013, will be followed by further consultations and development of a final NHI policy, after which the legislative process will ensue. Ward-based PHC agents. Approximately 25% of the 40 000 community health workers have been re-trained in the new, national approach to community-orientated PHC. School health services. The national policy focuses on the most disadvantaged schools, with mobile clinics to support preventive and health promotion services aimed at reducing health barriers to learning, and facilitating access to other services. District clinical specialist teams. These teams will focus on improving the health of mothers, newborns and children. Every district will have a senior obstetrician and gynaecologist, paediatrician, family physician, midwife, paediatric nurse and PHC nurse. Over 43% of positions have been filled, and the induction programme for these professionals is underway. An audit of the quality of all public sector facilities has been completed and improvement teams are working in the NHI pilot districts to help ensure that the many problems identified are being systematically addressed. Work is underway with provinces to plan, manage, modernise, rationalise and transform infrastructure. This includes expanding on existing facilities, building new infrastructure where long-term solutions are required, and using mobile or prefabricated facilities to resolve acute problems. Major infrastructure projects are also underway in five tertiary hospitals: Limpopo Academic, Chris Hani Baragwanath Academic, Dr George Mukhari, Nelson Mandela Academic and King Edward VIII. Technology will play a major role in improving outcomes and the delivery of services, but can be costly. A rigorous, independent mechanism to assess the cost-effectiveness of new technology is required, building on experience of other countries. The recently launched national e-health strategy also aims to harness information communication technologies to help transform the health system. The transformation of the health system requires closer engagement of local communities. Strengthening clinic committees and hospital boards remains a priority, and new guidance on this is being prepared. clinical governance and capacity building of the PHC team. Work has also started with central hospitals in Gauteng to prepare them for future financing under NHI. This focuses on improved resource management, administration, information systems, and governance through strengthening boards. Countries with universal coverage have well-established mechanisms for pooling funding to address equity, efficiency and sustainability of health expenditures; the NDOH is therefore examining the options for introducing a set of tariffs backed up with appropriate legislation. Legislation has already been passed to enable the Office for Health Standards and Compliance to accredit public and private facilities, based on established national standards. It has already started voluntary inspections, which will soon be mandatory. The Bill has been approved for the establishment of the South African Health Products Regulatory Body to register and control the medicines and medical devices to be available in SA and due to be launched as an independent body in 2013. An institutional mechanism is also required to guide the uptake of new health technology under NHI, backed up by appropriate legislation. NHI will require effective delegations of responsibilities linked to improved oversight and accountability at all levels. The NDOH is exploring the options for and costs of establishing District Health Authorities (DHAs). This will require considerable efforts to strengthen the capacity of district management teams in areas such as financial management, planning, monitoring, evaluation and contracting. The NDOH is also preparing guidance for strengthening hospital boards in the public sector and will be seeking stronger oversight and accountability of central hospitals. The future NHI will be reliant on an effective information system. Considerable efforts are required to improve the quality, coverage and standardisation of information across the public and private systems. National indicators and targets have now been agreed for priority areas in the Negotiated Service Delivery Agreement for Health through the work of the Health Data Advisory and Coordination Committee. [141 Health facility data on public and private providers have been loaded onto a new National Health Information Repository and Database, together with information on service access and determinants of health, that will be made available to provinces, districts and service providers. A new system of population registration is being developed in partnership with the Department of Science and Technology and the Council for Scientific and Industrial Research (CSIR). NHI will require a 'National Health Data Dictionary' using various coding systems. In this regard, the ICD-10 (10th revision of the International Statistical Classification of Diseases) system is not yet operating satisfactorily and will need to be strengthened. Coding systems permitting case-based hospital payment (e.g. diagnostic related groups), unique provider numbers, facility numbers, specialty codes, and laboratory results encoding are to be developed. Patient records in both primary and hospital-based care need considerably more work, building on the innovations already in use across the country. As one of its primary objectives, the national e-health strategy seeks to better co-ordinate and bring synergy to these efforts. 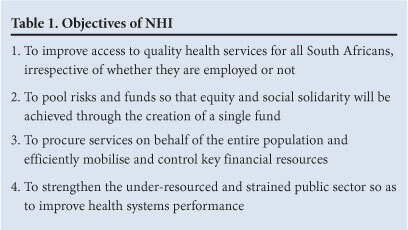 New national institutions are also required for NHI to function, each with bodies to oversee their work. The Office for Health Standards and Compliance, to be launched in 2013, will report directly to the Minister. The Green Paper provided estimates of the additional revenue required to implement the NHI over 14 years, and the Treasury has now updated the model used for this assessment. In addition the NDOH has commissioned a detailed assessment of costs to inform planning. This will focus on the specific intervention requirements for each pilot district. These will include strengthening district (and sub-district) management teams and creating district health authorities, developing a comprehensive service benefits scheme, strengthening health facilities, strengthening the three PHC streams, contracting private providers, strengthening emergency medical services, strengthening referral systems, and attending to other preparatory activities related to specific district needs. The Treasury is working on options for raising revenue for the future NHI, which include consideration of a payroll tax (payable by both employees and employers), a higher value-added tax rate or a surcharge on taxable income, or some combination of these. The NDOH has provided R150 million to develop new systems and capacities in pilot districts and central hospitals, provided through a new conditional grant, and these 'NHI business plans' will be scaled up in 2013/14, to R350 million. As the quality of public sector services improves, there is likely to be an increase in their use, which will have implications for the rest of the sector and will require further analysis and consultation. Similarly, greater consultation is required to better understand the implications of increased demand for services from medical specialists, general practitioners, and other health professions. The forthcoming NHI White Paper will provide further opportunities for the NDOH to consult and discuss the vision of NHI and its implications with a wide range of stakeholders. Making change happen will be difficult at first, and senior Facility Improvement Project Managers in each province, reporting directly to Heads of Departments and the NDOH, will oversee the implementation of NHI business plans in each district. Learning from experience is critically important, and formal evaluations and operational research will therefore be required. Keeping the equity focus of NHI will entail special effort in under-served populations such as in informal settlements and deep rural areas. SA is building a better understanding of what NHI is and why it must be implemented. The NDOH has agreed on a timetable for implementation of NHI, which, while ambitious by international standards, is possible. Even so, it will take time for these major changes to impact on people's lives, and expectations will need to be carefully managed. Universal coverage is no longer a dream for SA and will become increasingly certain if all players work and strive together.